Almost everything is now dressed in its new fresh foliage for spring. Even evergreens like Box are covered with bright green leaves, a reminder to me that they should ideally be pruned into shape now so that they still have some time, before the really hot weather and their summer dormancy, to grow. This is the first time they have put on so much new growth; a good friend has a theory that the sharp cold weather we had in February has shocked some shrubs into producing for new foliage and more flowers this year. April is the month when the most change happens most quickly in the garden. Despite there being a large number of flowers now it is still the foliage that does the biggest job in making the garden look full and lush. 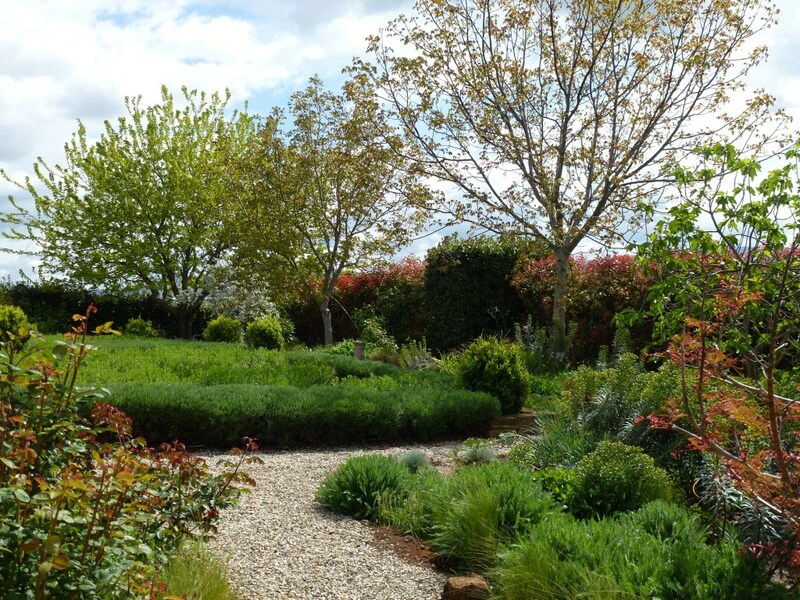 Looking between the circular rose bed and small island to the formal beds and to the right the back boundary border. 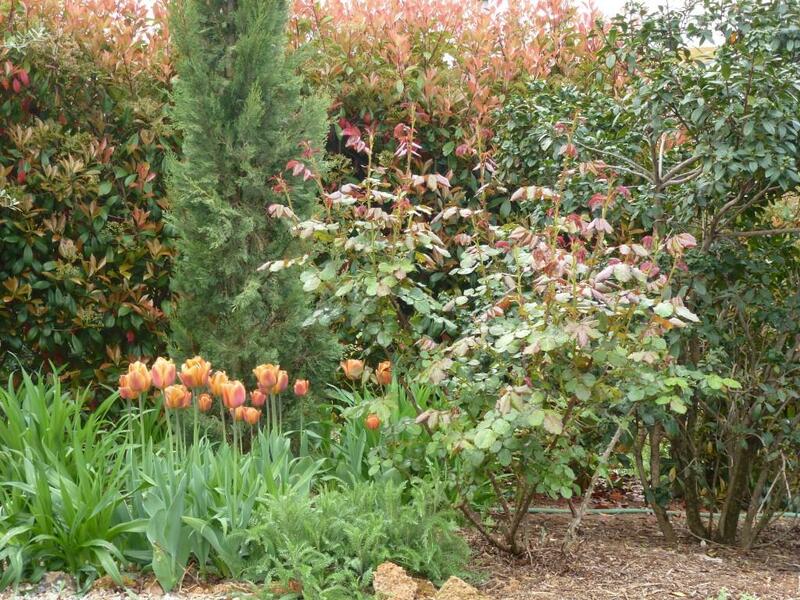 I think of spring as being green, but many plants produce bronze or other coloured leaves before they turn green. This, as in autumn, is a defensive mechanism to protect the tender new leaves from the strong sun and maybe also the startling changes in temperature that often occur in spring. 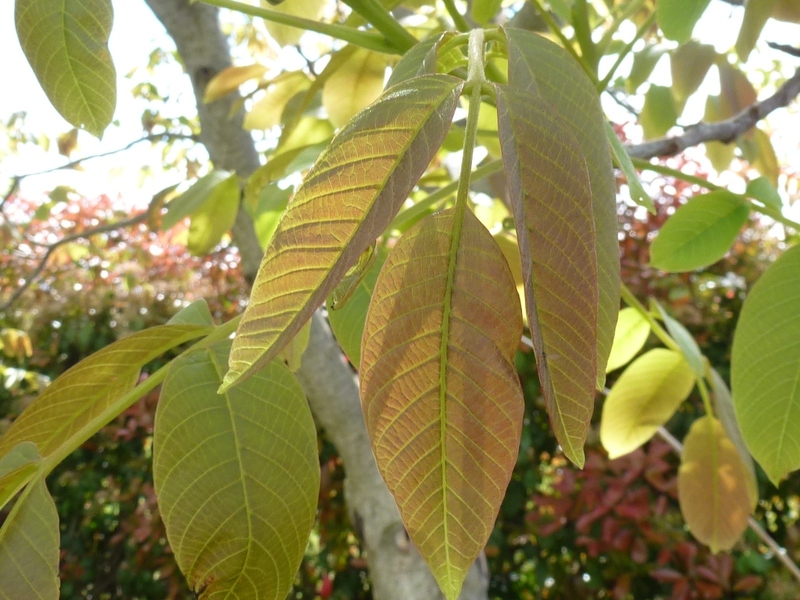 I love the delicate colour of the walnut tree leaves, it is probably its most attractive just as its leaves unfurl. When we moved here a good percentage of the boundary hedge was composed of Photinia, it is a shrub that I used to dismiss as being rather boring. It is widely used here, as once established it is very tolerant of summer drought. It also doesn’t mind the strong winds, either cold winter Tramontana or hot summer from the not so distant sea. 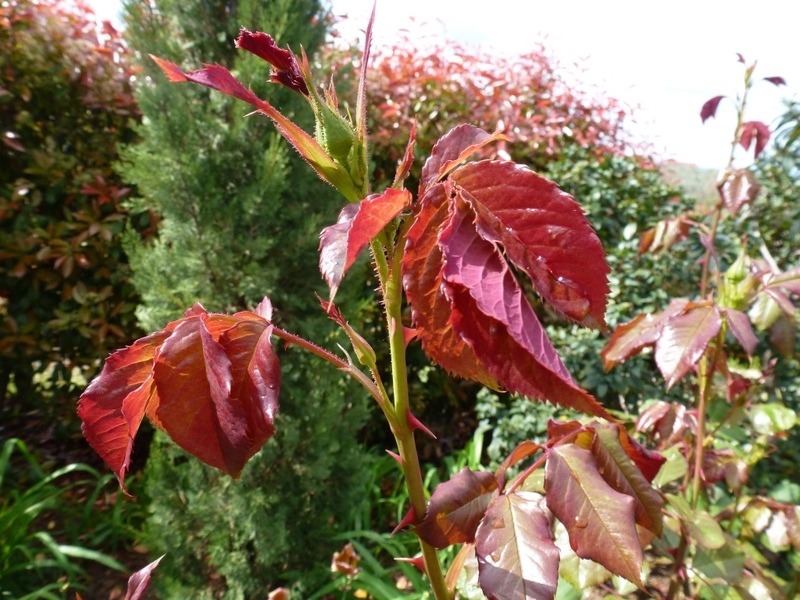 The foliage in spring reflects the colour of my favourite tulips ‘Brown Sugar’ and the new foliage growth of Rosa Westerland. 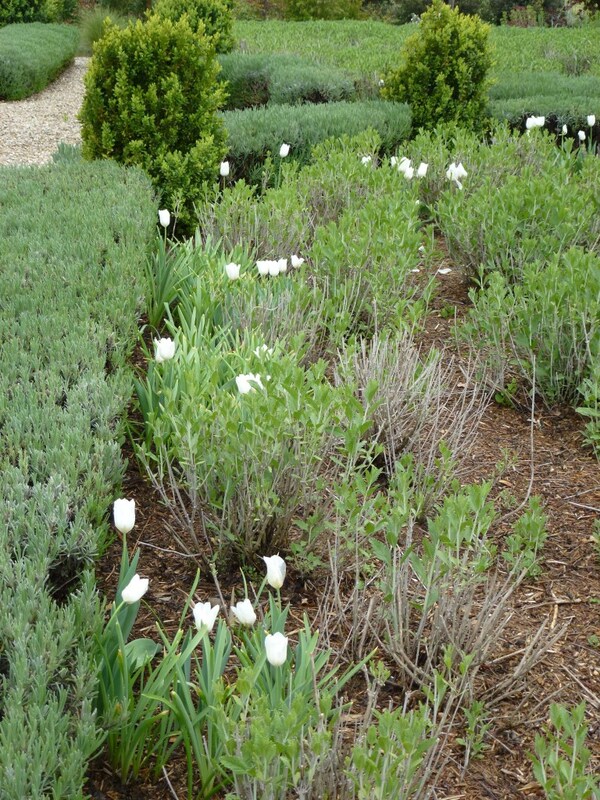 It also gave a interesting contrast when there were a large number of white tulips in the formal beds. When their flowers open they are an attraction to the bees who love the strange perfume (I’m not so sure I like it). I happened on a post the other day written by The sproutling writes all about how she loves roses for their foliage more than their flowers! 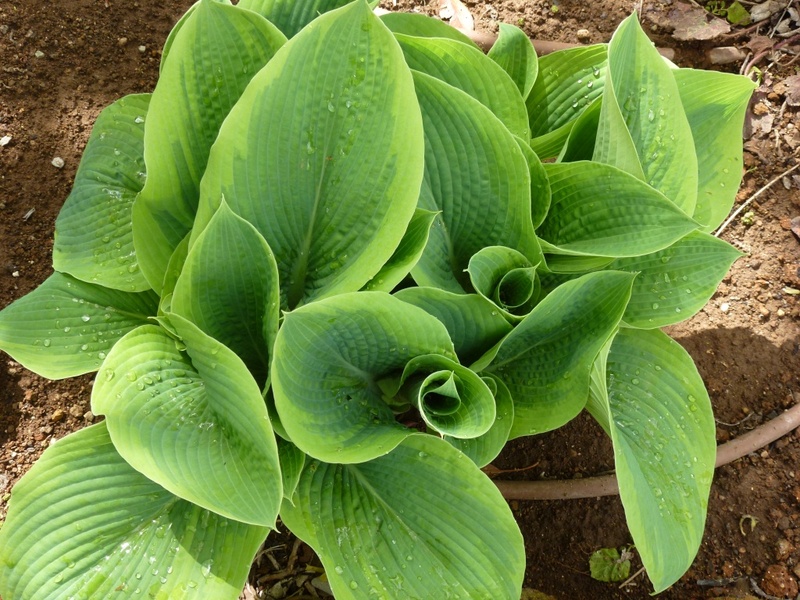 Hostas are spiralling out of the ground, their new leaves pushing through the soil where a few days before I had wondered if they had survived the winter as there was nothing at all to see. 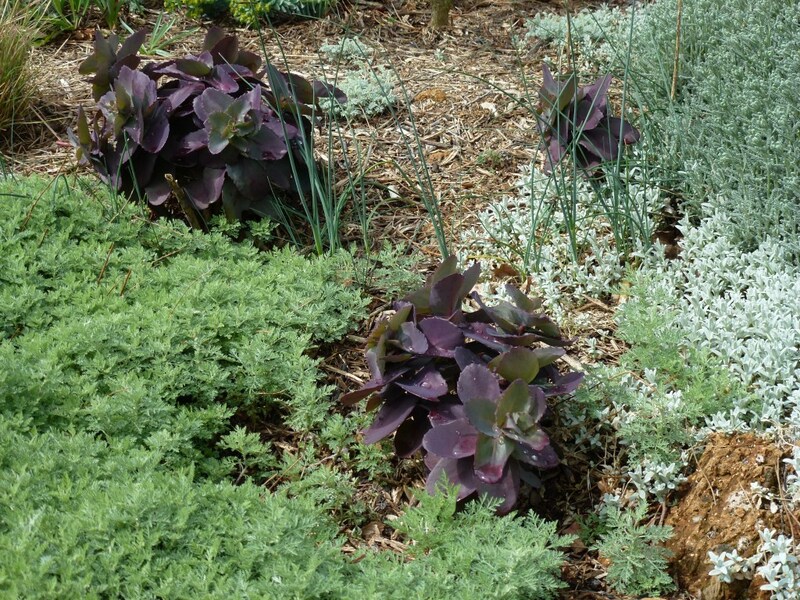 The silver-leaved plants sparkle in the sun and they are creating some lovely combination with purple sedum, Rosa Rubrifolia and Cotinus. 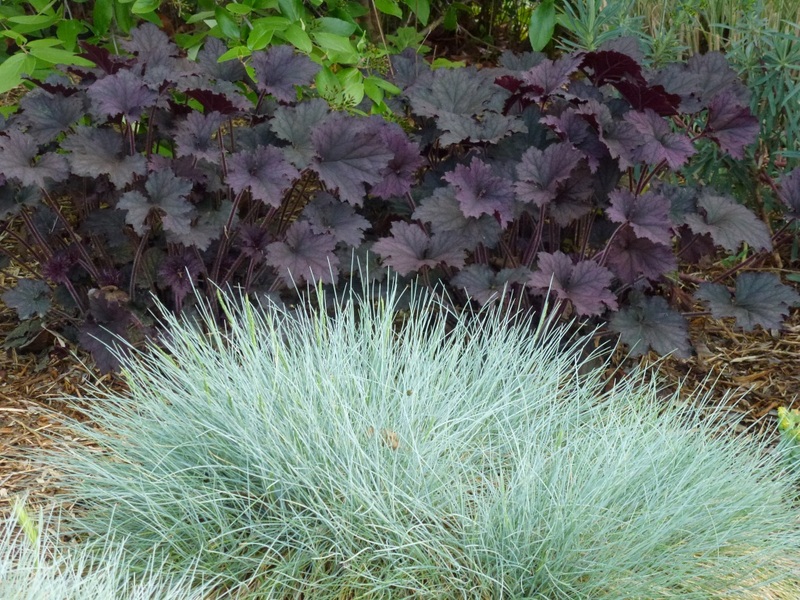 Dark Heuchera contrasts with Festuca glauca. 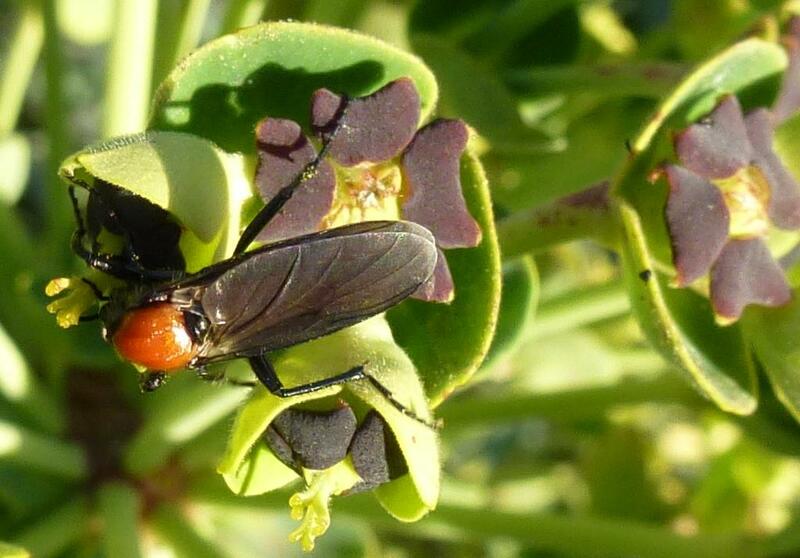 Here are some images that illustrate what happens to when a silver-leaved plant gets wet. 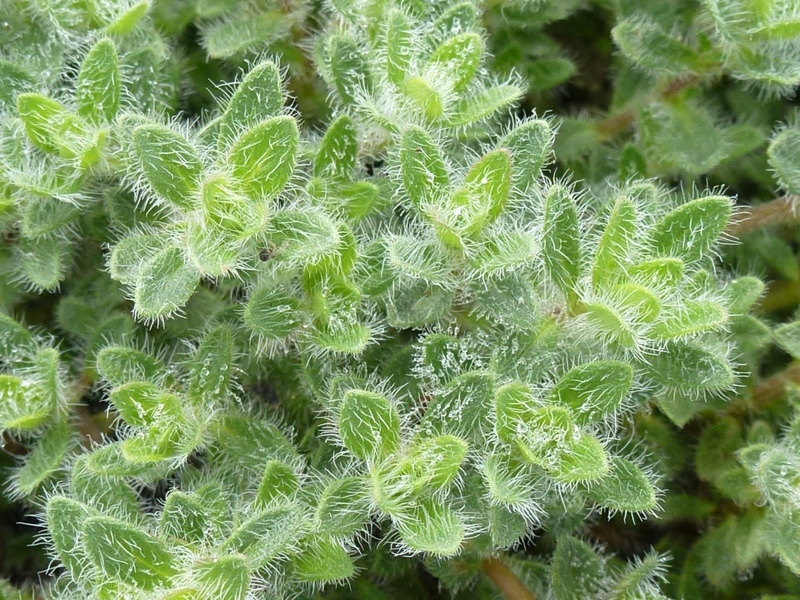 The hairs on the leaves get wet and don’t reflect light in the same way; result the leaf appears green. With macro, you can see why. 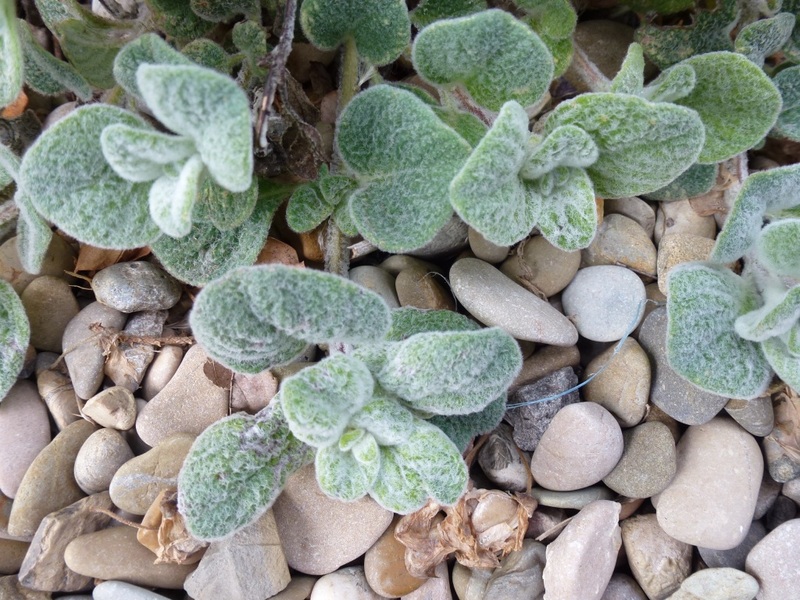 Actually the leaves ARE green and appear silver because of the hairs not the other way around as I described above. 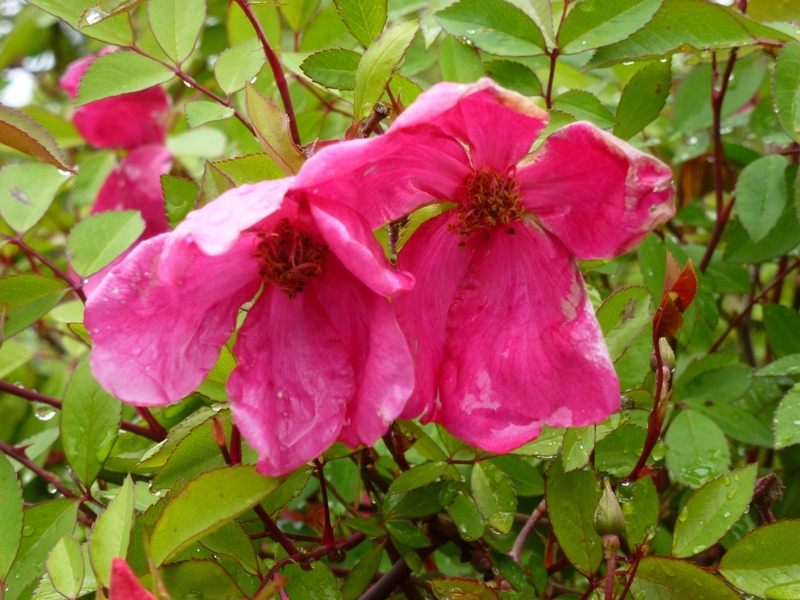 Please click on the image below of Rosa rubrifolia to see the rest of the foliage in My Hesperides Garden today. Did you spot the wasp making its nest in the middle of the Lavender? All are most welcome to join in GBFD, just leave a comment and a link to your post (or wordpress will do it for you). Happy Gardening! 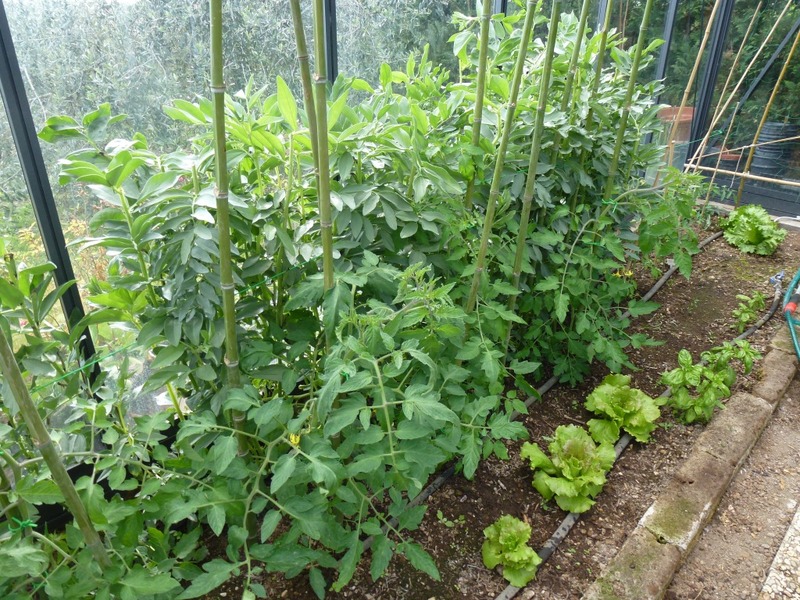 I thought I’d join Helen at Patient gardener this month with an update on the greenhouse. 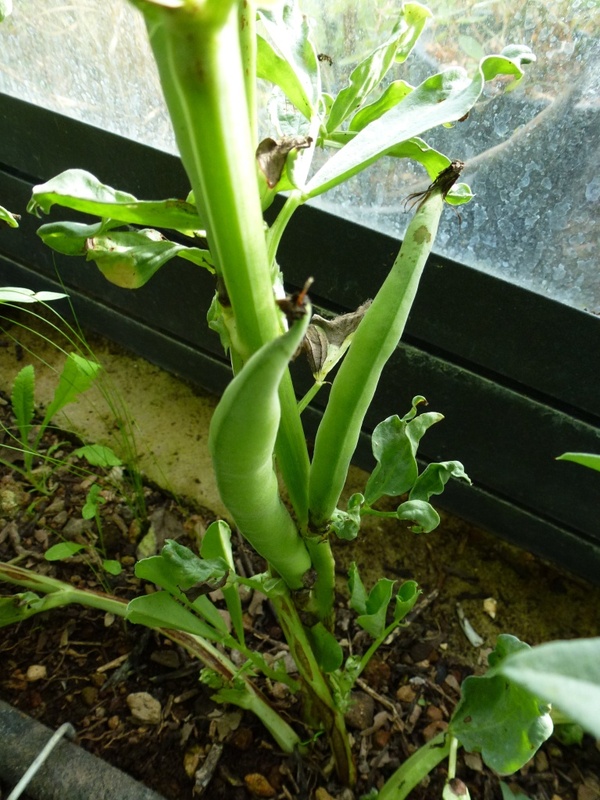 The broad beans I planted in late November or early December have gown tall (maybe too tall) and have beans! 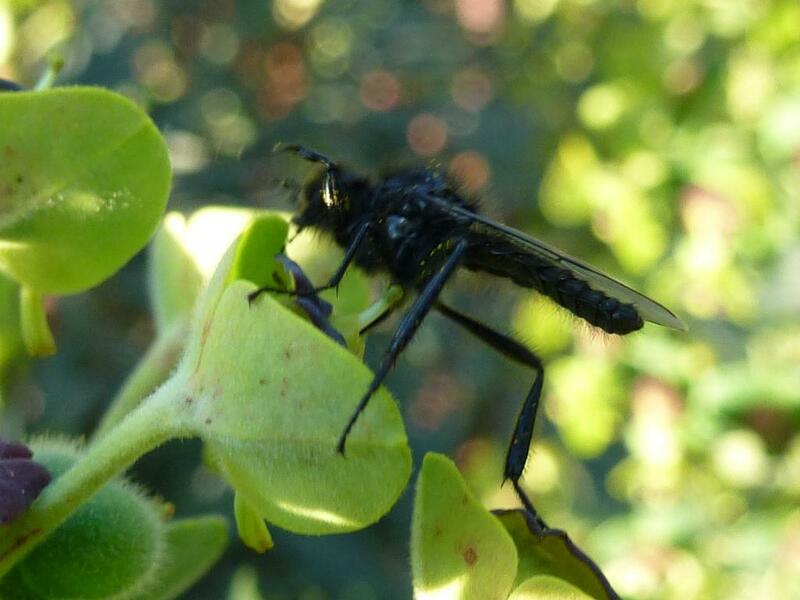 In March when the weather was much hotter than now I worried that no pollinators would live long enough in the heat to actually pollinate the flowers. There must have been enough as the beans are forming quite low down so are presumably the first flowers from March. My husband love broad beans (I’m not so keen) and he thinks my lack of success in the past is because I have been trying hard enough because I don’t want to eat them! He likes them raw served pecorino cheese and salami, a classic antipasto in this area. He also like them cooked in young tender pods and that really needs for them to be home-grown as the farmers want them to be bigger, so with tough pods. I am pleased with my experiment to grow carrots in a pot. Again I sowed these in November I think. 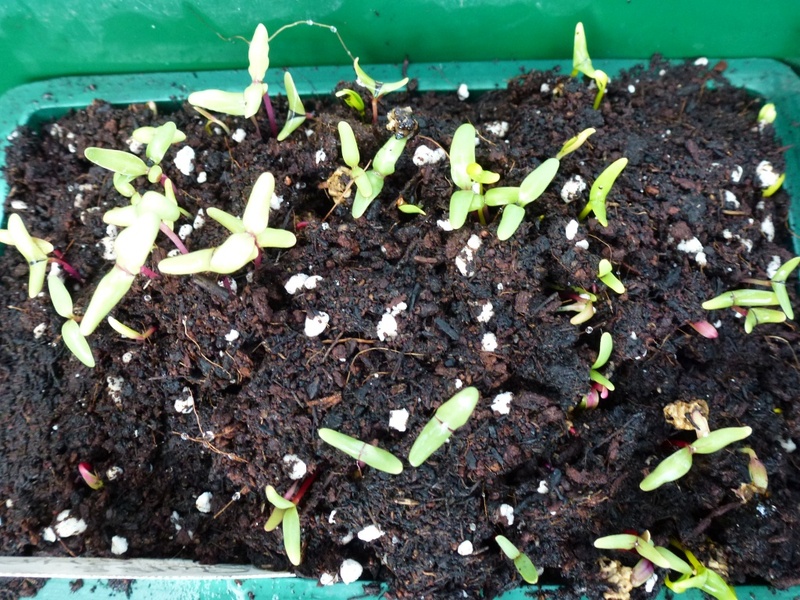 I rather stupidly sowed them into my own compost without first letting the weed seed germinate so I am sure I disturbed and even weeded out some of the carrots. They are certainly the best carrots I’ve ever grown as I’ve always had stony soil and that’s not good for any root vegetables. I’ll post an image of the carrots when I pull some for the kitchen next week. Seed production has been erratic. I sowed various things before I went to England in March, I had the hot tray in the house but then at the last moment was worried it might start a fire so I switched it off. 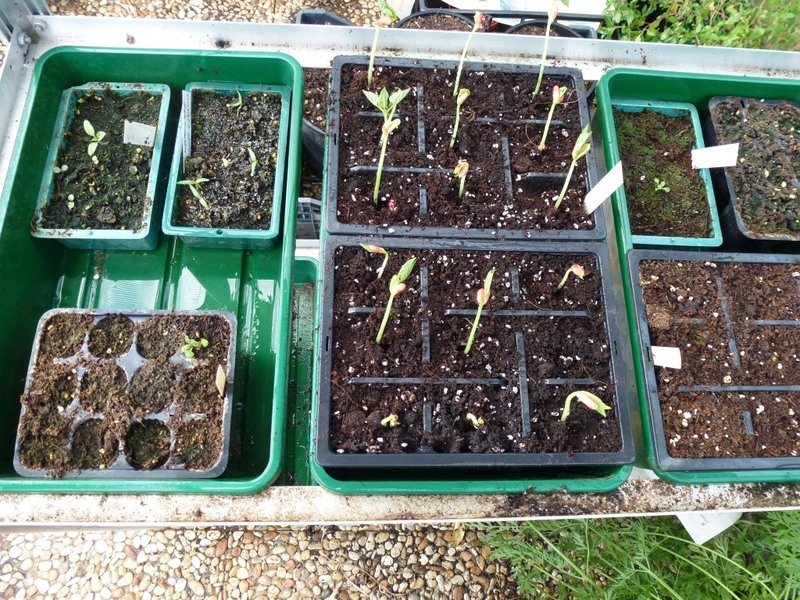 When I returned, nothing had germinated so I moved the tray out into the greenhouse but this was a big mistake! It was so hot during the day, the seeds all cooked I think. Just a couple of Thai basil seedlings and 4 black climbing beans. 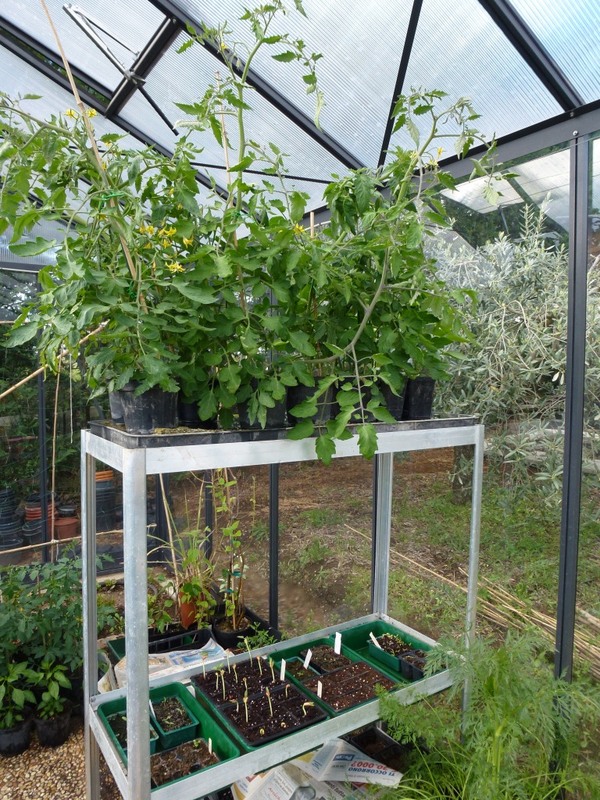 When it was cooler in March I persevered in the greenhouse but I am sure the vast difference between day and night-time temperatures was still not what the seeds needed. So on Monday this week, I started again! I bought the heat tray back onto a indoors windowsill and already I have climbing beans, sweet corn (lots of sweet corn) and rainbow chard germinated and a little more Thai Basil is slowly pushing up. So result! I don’t really want the seed trays inside so I will have to think of some other idea for next year. 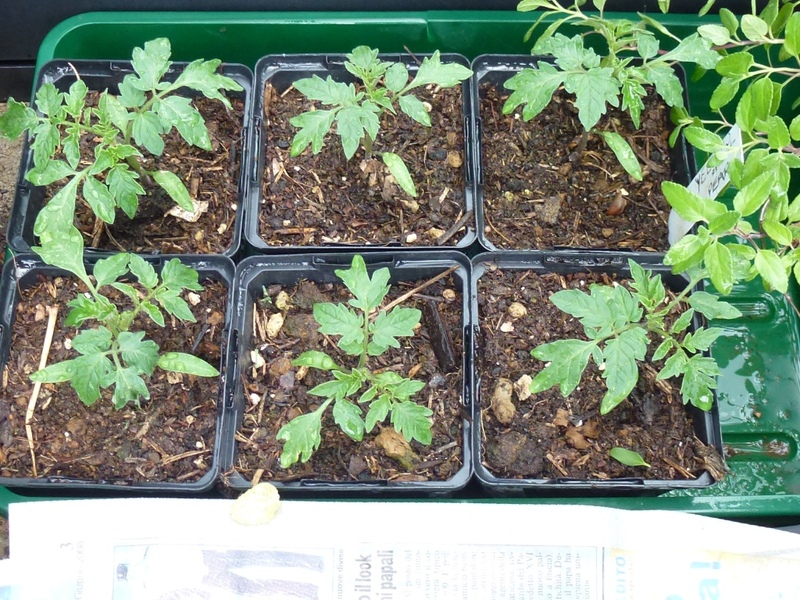 I bought most of the tomatoes as small plugs from my local supplier and potted them on. They are now waiting to go outside. I had planted outside at this time last year but this year is COLD! 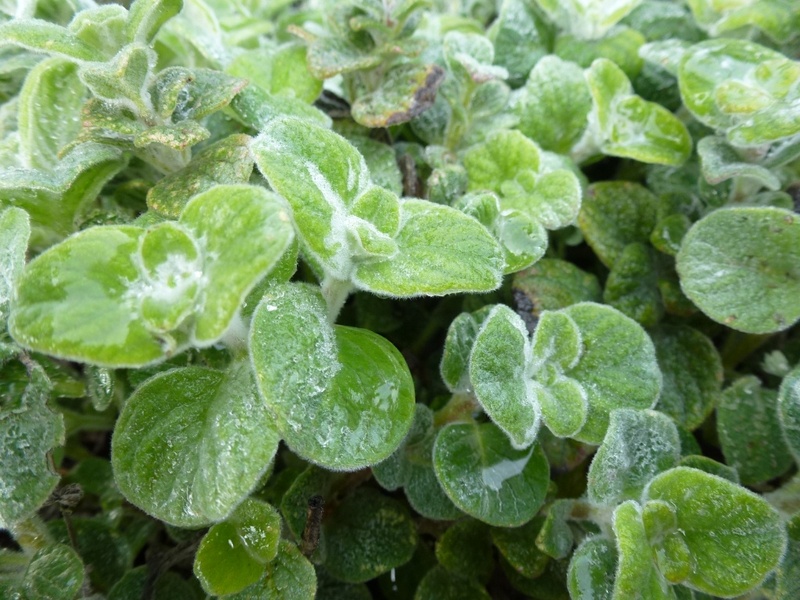 We’ve even had a slight frost so they have to wait a little longer – it would be silly to lose them now. Especially as one has fruit already! These I grew from saved seed. They are small yellow pear-shaped and look lovely in roasted summer vegetables. They’ll soon catch up with the other plants. 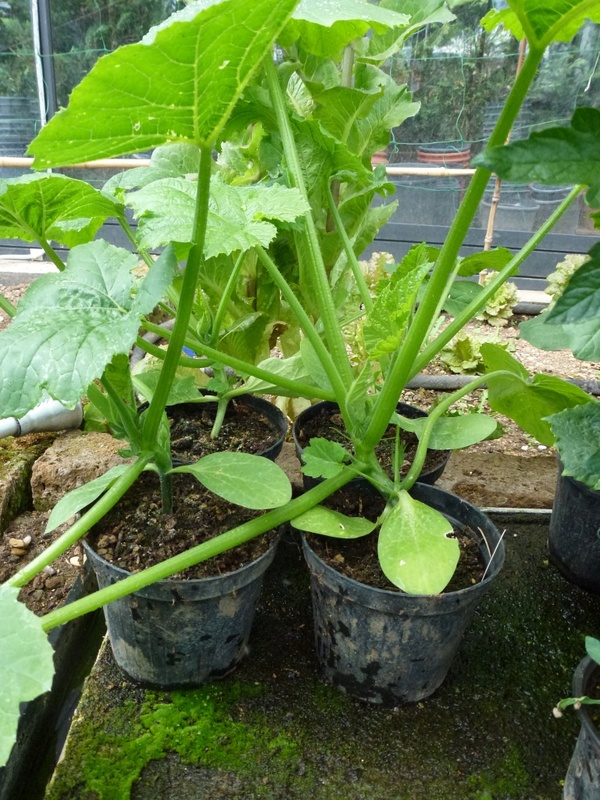 The zucchini are also getting very large; if they get to big they won’t transplant so well. So I’m hoping for some warmer weather next week so that the greenhouse can be emptied of all the plants that need to be outside. Don’t forget GBFoliageD on Sunday 22nd! Share your beautiful spring/autumn foliage. Is there a plant they you love for its foliage when most people grow it for flowers? Just do the post and leave a comment on mine. When I walk around the garden one pleasure that is difficult to share via this blog is the SOUND in the garden. 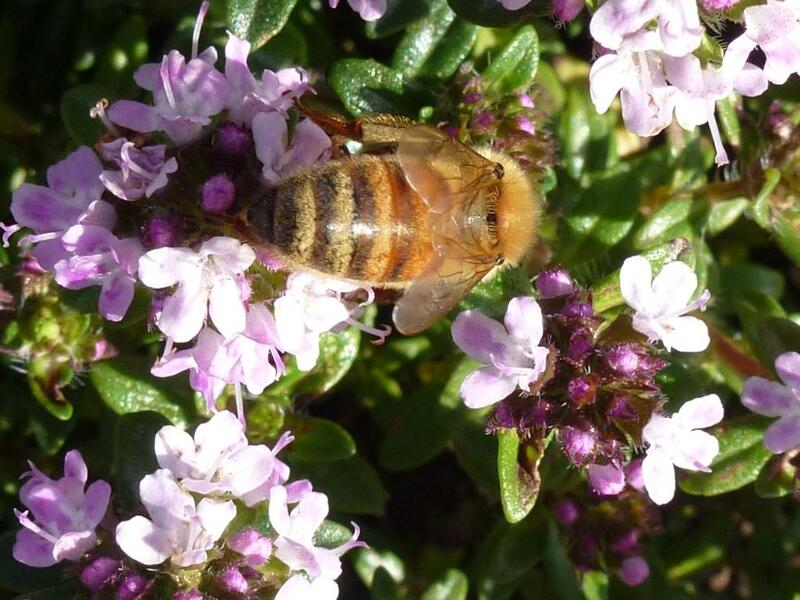 Bees of all kind buzzing and flying from flower to flower and by default pollinating the plants will the air with sound! Sometimes I am aware that the garden is positively noisy! 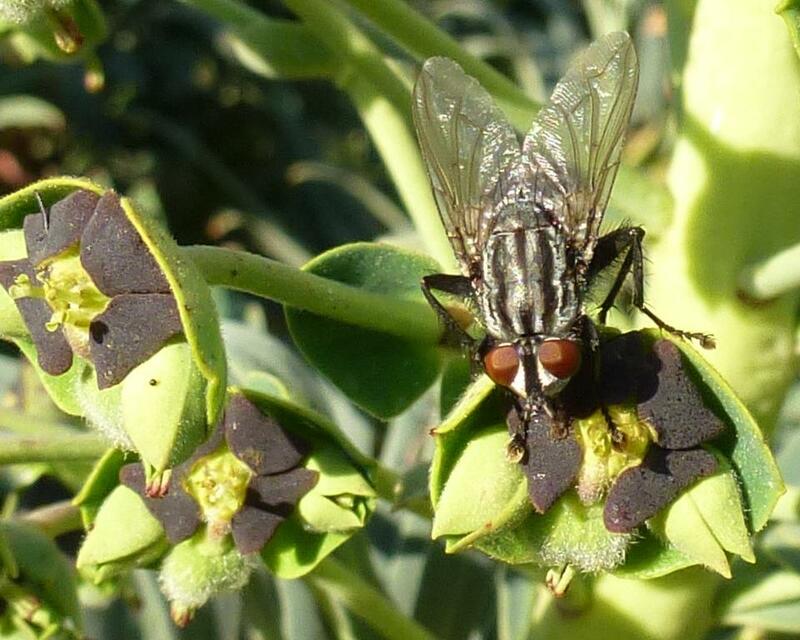 I notice that different plants attract different pollinators. 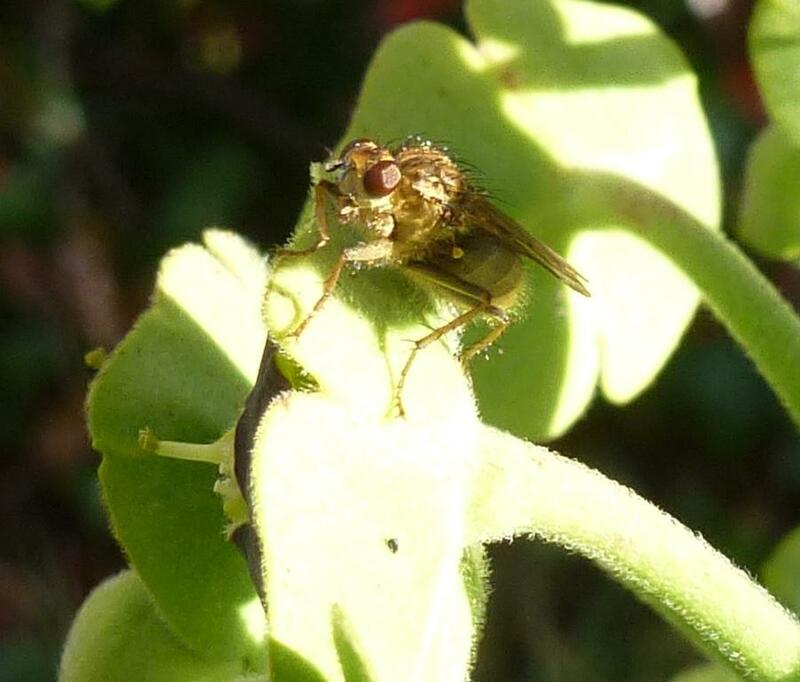 Entomology is a skilled science and I will leave the difficult job of identification to the experts as I am certainly not an expert in this field. 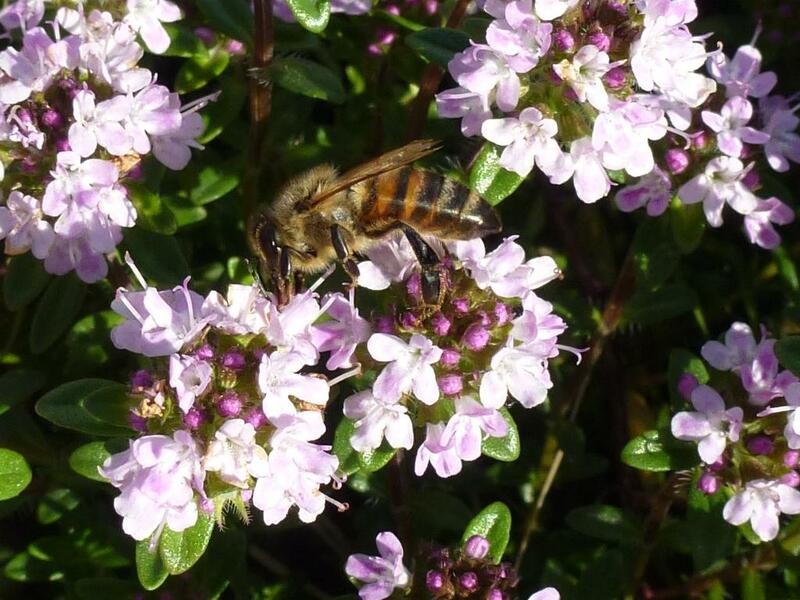 Thyme attracts what I think I recognise as honey bees; I’ve thought hard about actually having a hive but I think I would find it difficult, I don’t like the thought of being stung plus perhaps more importantly I don’t think we would ever use the amount of honey a hive is likely to produce. 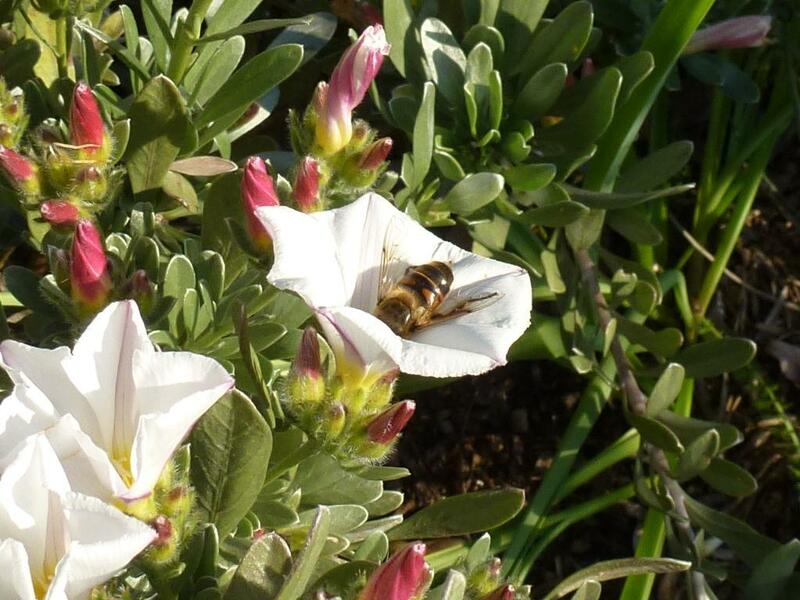 Convolvulus cneorum also attracts honey bees. Teucrium attract larger bees, but they were too fast for me today and all the images were blurred. I’ll try again on a less windy day when they might be more static. All the T. Satin Pink had one of these in their centres today. At first glance they look like bees but I’m pretty sure they’re not. 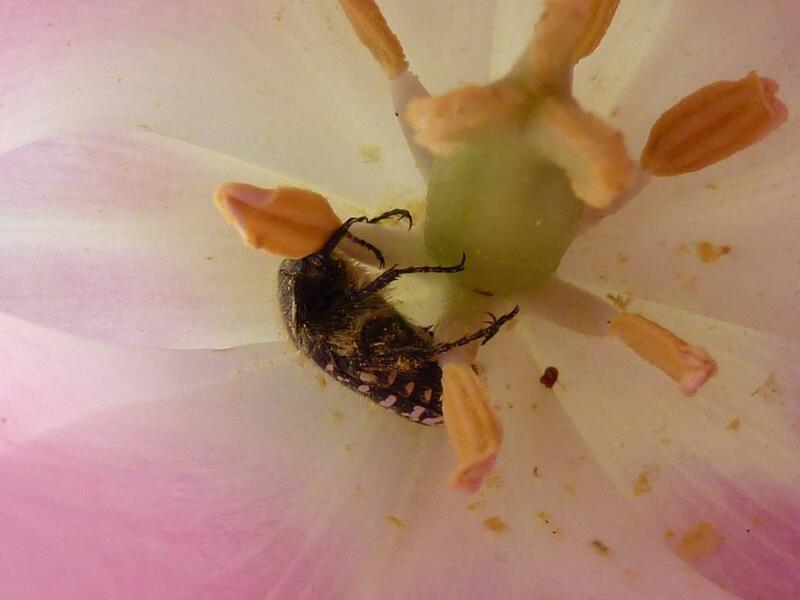 When the roses begin to flower this is the pest that eats into the centre of the flowers, destroying them, the tulips may have even killed them as they weren’t really moving. When they appear on the roses I go around and pick them out (wearing gloves as I’m a bit squeamish) and squash them to stop them reproducing and getting out of control as they don’t appear to have a natural predator. 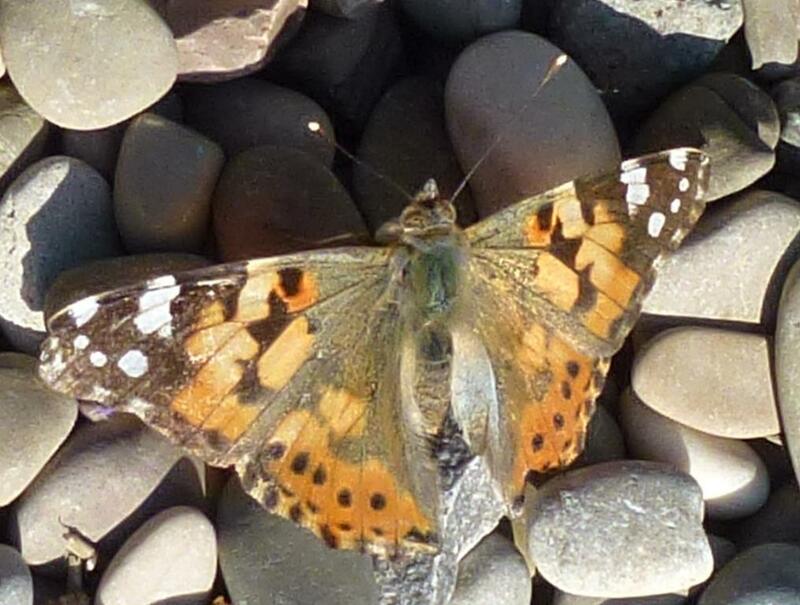 On warm days this week there have also been lots of butterflies but I have failed to get good images of them. This is from earlier in the week. don’t forget Garden Bloggers Foliage Day, here on the 22nd, please feel free to join in and show the foliage in your garden. 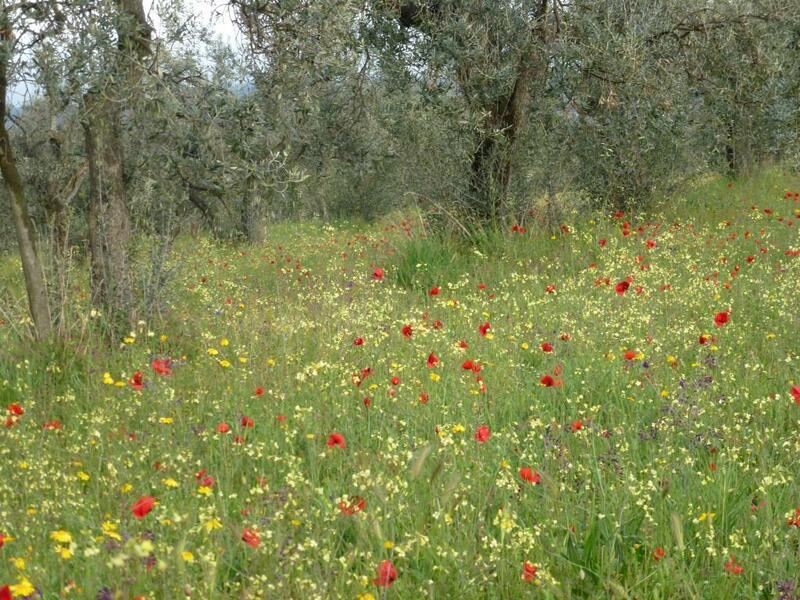 I love the spring for the beautiful wild flowers in the countryside. 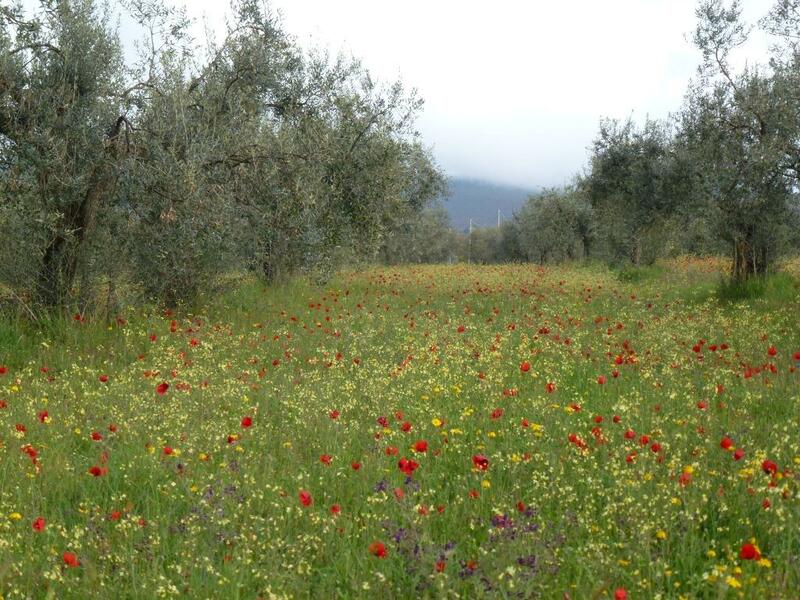 I am so pleased that the farmers don’t spray the fields to eliminate and kill all the native plants. 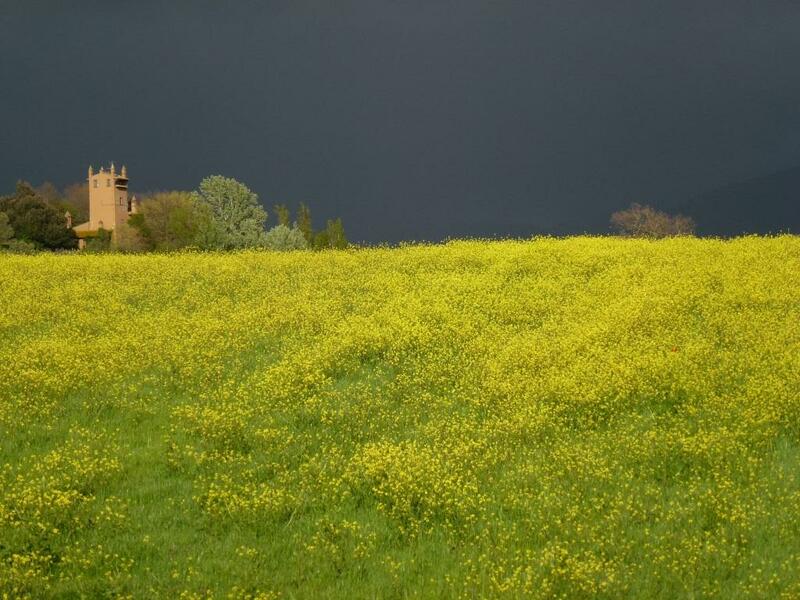 We have had a week of grey days and rain, soft gentle rain so far but storms are predicted. Everything is green, even the silver plants look green as their hairs lie flat against the leaf and stop diffusing the light so they are green instead of silver. Lavender, Perovskia plus the fresh new foliage of the box all add to the green-ness! Despite the warm winter most plants are slightly shier to bloom this spring, the freezing cold weather in February has obviously had its effect. In the middle of the week when I walked around wondering what would be flowering for 2012’s April GBBD I believed there were far fewer blooms than last year; and it is true that some plants are just beginning to flower instead of being in full-bloom but today when I ventured out between the showers I found some tight buds had opened so that this April’s post is more similar to last years than I thought. If you would like to compare with last year please click here. 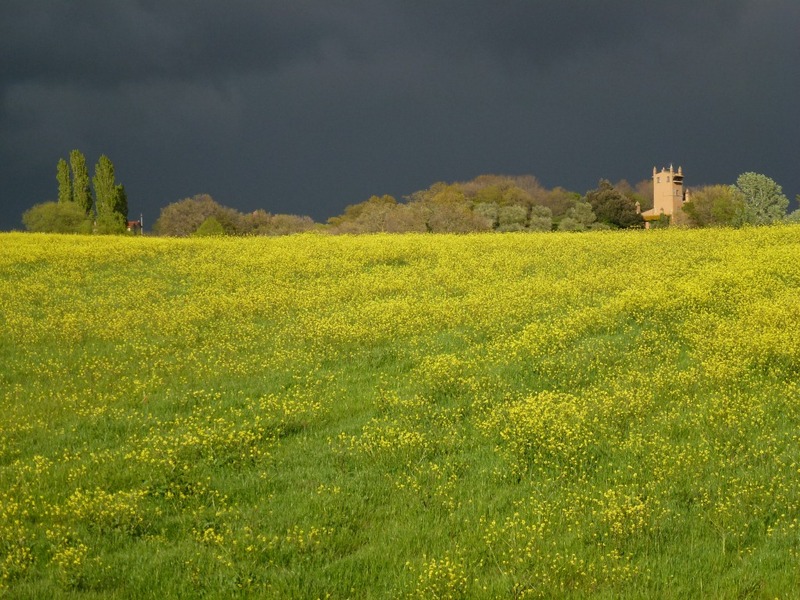 Even the weather is not dissimilar to last year, so spring rain is not unusual … and thank goodness for that as the ground was very dry – we have had virtually no rain for a year except for the flood in September. 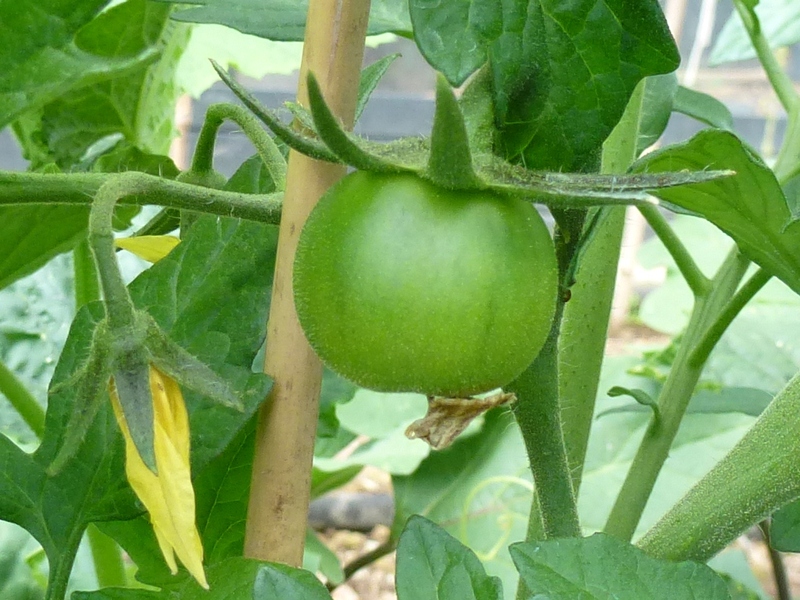 Temperatures are lower than they were a month ago we had a slight frost the other morning and tonight is forecast to dip to 3°C so I haven’t planted out my tomatoes just yet although they are getting tall and have flowers so I would like to get them into the ground. 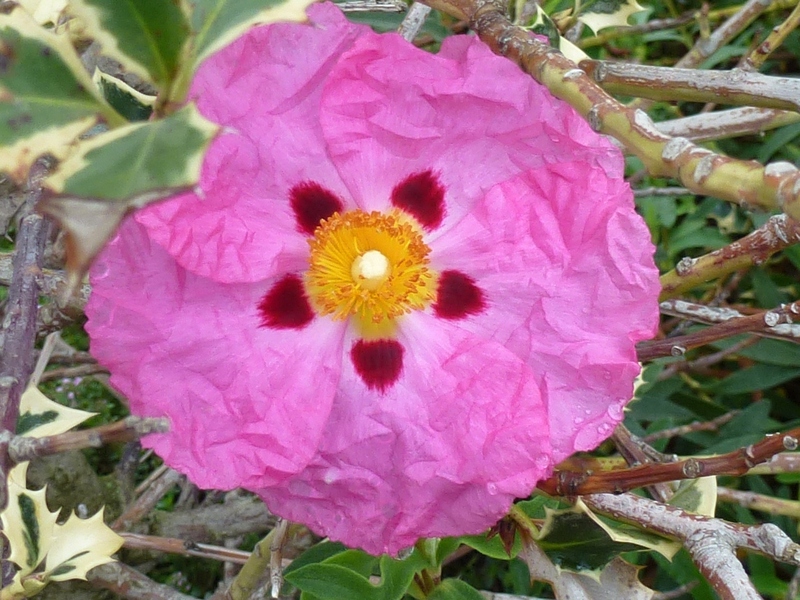 It seems early for cistus but it was flowering last year at this time too. There are fat buds on many of the Bearded Irises so they won’t be long; all the roses are full of bud and hope for a good show, Rosa mutabilis is always the first to have a lot of bloom and this year is no exception, I do think this is such a good value rose. 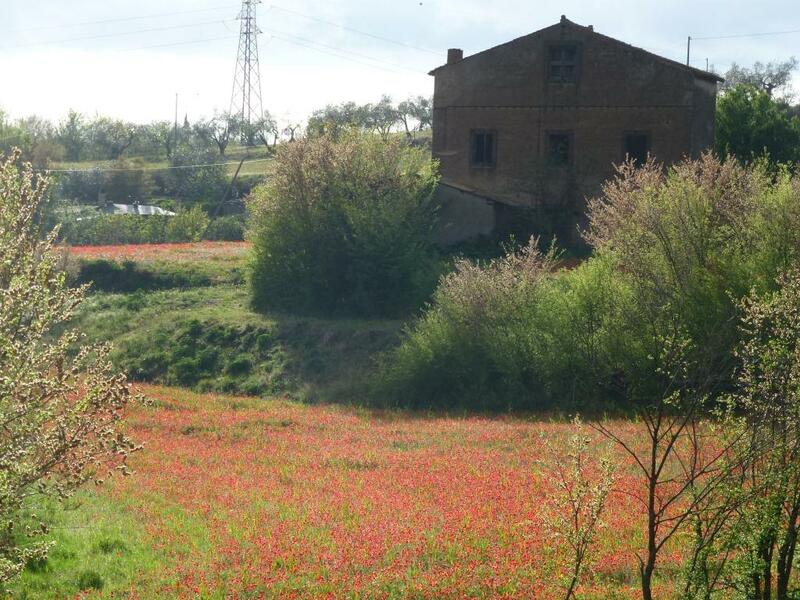 It flowers for 9 months of the year and the foliage is a great colour and very healthy. 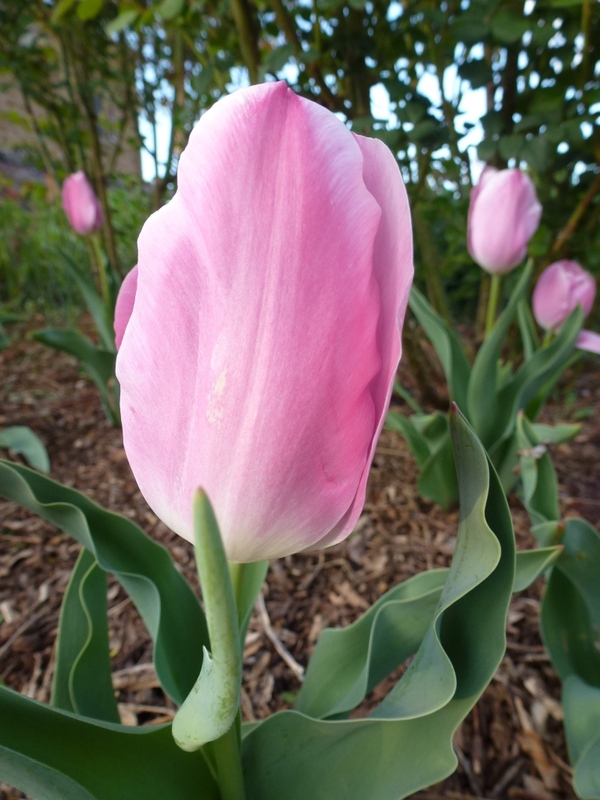 April is THE month for tulips! 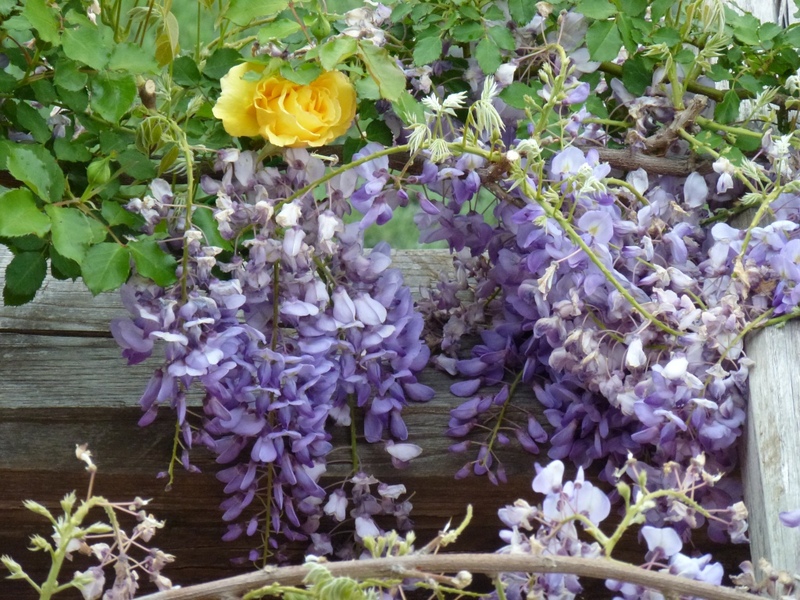 Click on the image below to see all the blooms in My Hesperides Garden this April GBBD, and a very happy Bloom Day to all gardeners everywhere. I’m linking to Carol at Maydreams who hosts this interesting meme. Visit her to see what’s happening in other parts of the world at this special time of year- spring in the northern hemisphere and autumn in the southern hemisphere. 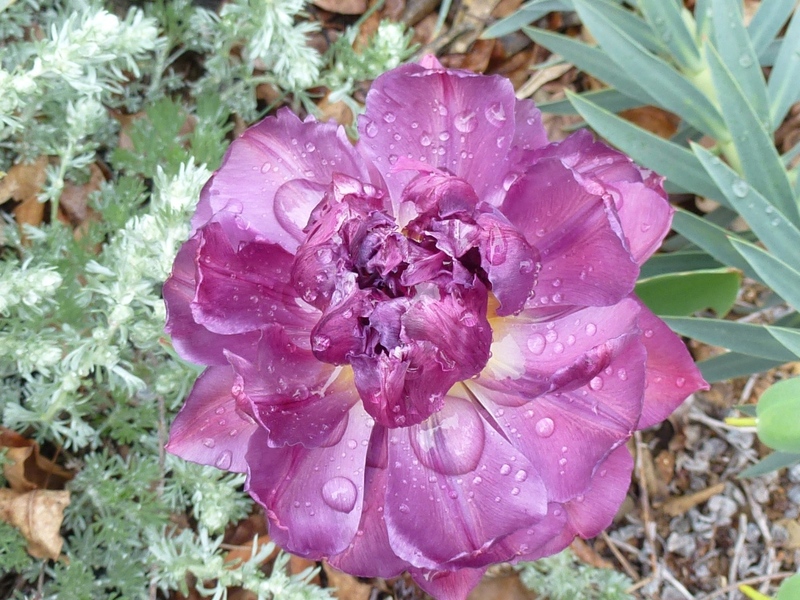 From recent posts it seems much of the world is having rain – always good for the garden. 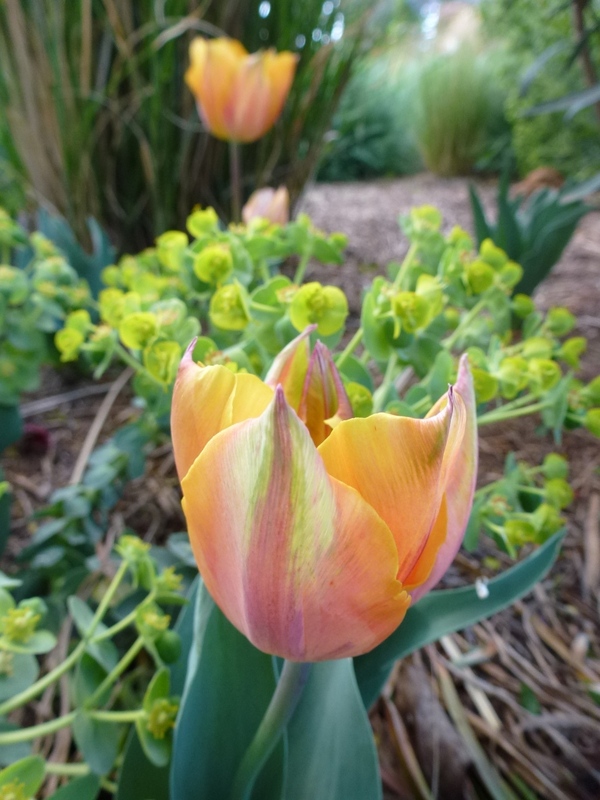 There was a time when I didn’t really like tulips, I don’t even remember why but for many years now they are truly one of my favourite flowering plants. I love them for their bright colours, for their beautiful flower shapes and because they flower early and tell me it is spring. 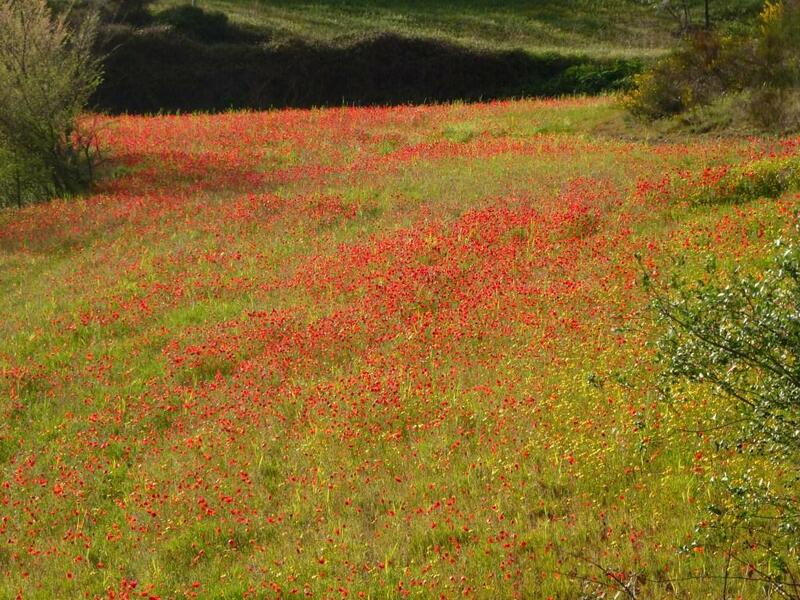 In England I would carefully work out the flowering periods and order to have the colours I needed spread over a six week to 2 month period, from Early April to Mid-May. Here they grow differently, true I don’t have to left them when they have flowered and many will return year on year making it easier to fill the borders with colour but they flower for a much shorter time-frame, from the last week in March to the end of April if I am lucky. In a warm spring as last year they flowered for perhaps three or four weeks. Last autumn I was strong willed and ordered no new spring bulbs. This was partly due to wanting spend the money on other things and more importantly I knew I needed to move and divide many perennials and thought I would be very short on time. The fact that the weather remained very warm right up until December meant I could have found an opportunity to plant some. It has been good to review which varieties really do perform well a second year and which need to be considered annuals. I have decided to plant the varieties I know to be shy about a return visit in pots which I will place on the terrace to enjoy from the windows or even to plant in places where I will cut them to enjoy inside the house. 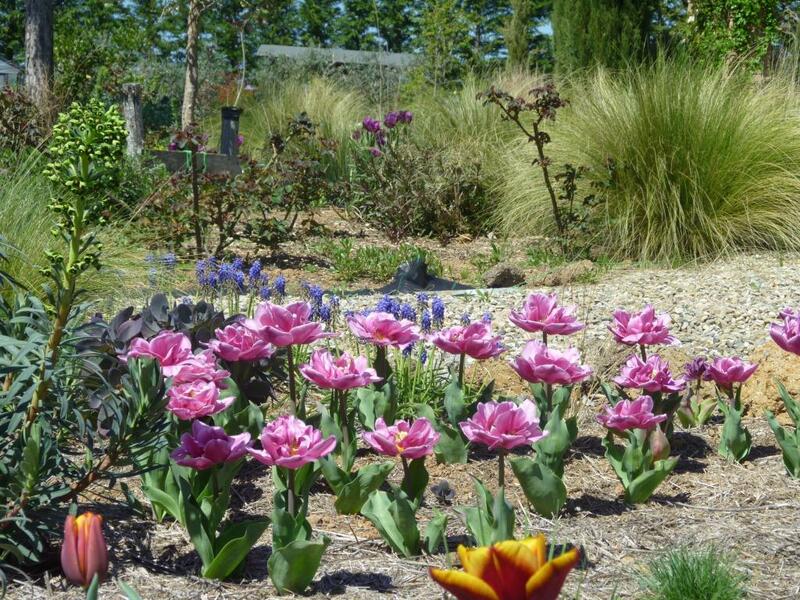 Those that are to be planted in the borders will need to be combined with plants that will grow to hide the tulips’ foliage when they have finished flowering which is not particularly attractive. Another consideration which may seem strange to some non-gardeners is that I like blooms to dye well, by this I mean that the petals should turn an attractive colour and fall gracefully. 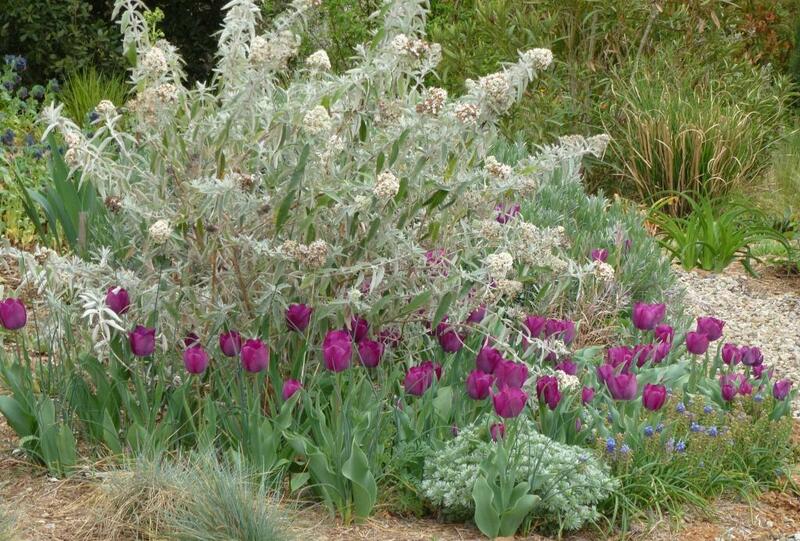 White blooms can be difficult in this respect as white blooms, of many different plants, turn brown. 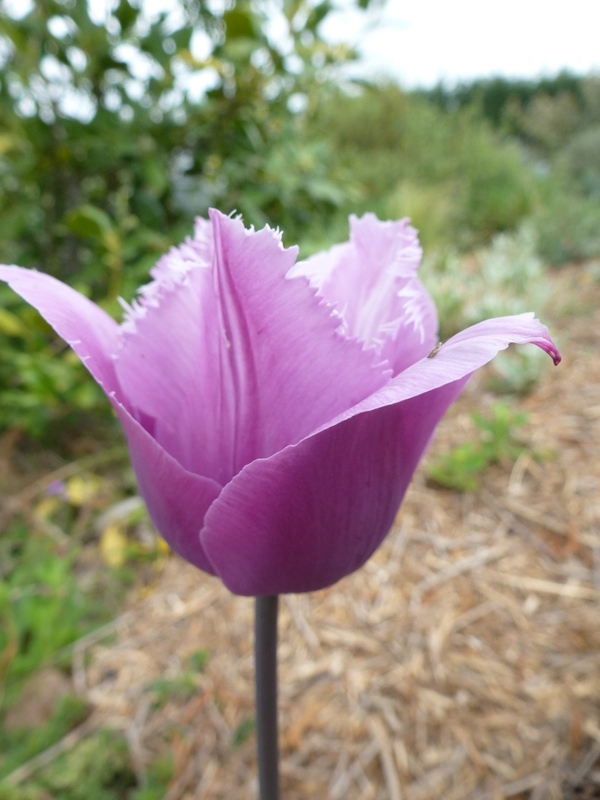 Here are my thoughts on the tulip varieties I have grown over the last few years and the combination plants I have found successful. Above is the boundary Photinia hedge with its orange, bronze new foliage with Rosa Westerland whose new foliage is a similar colour with T. Brown Sugar whose petals are a caramel colour. 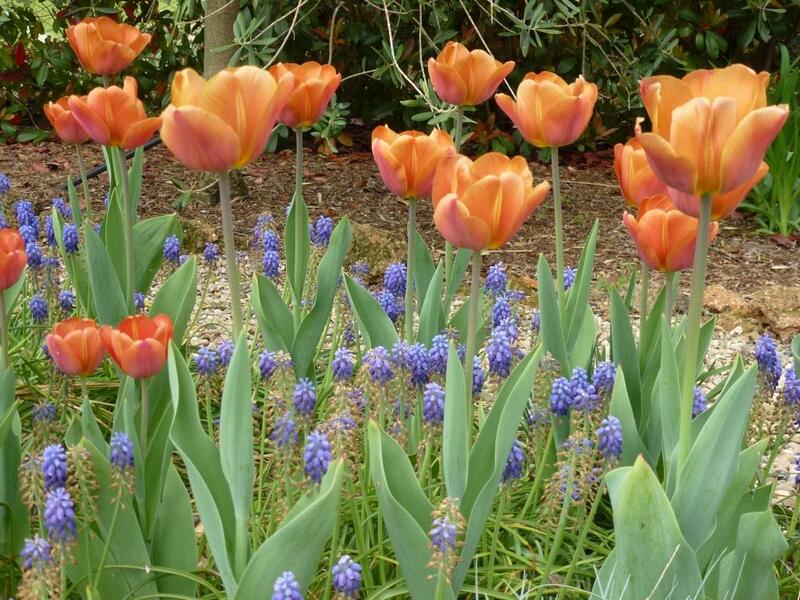 There are more planted in an adjacent bed with muscari to give a contrast from some angles. As ‘Brown Sugar’ dies, its petals look like a piece of iridescent silk, almost more beautiful than when they are first out. Added to this almost all the bulbs planted in 2010 have flowered again this spring. Tall orange Hemerocallis grow to hide the foliage as it dies back. T. Linifolia Planted in 2009, most have flowered this year. 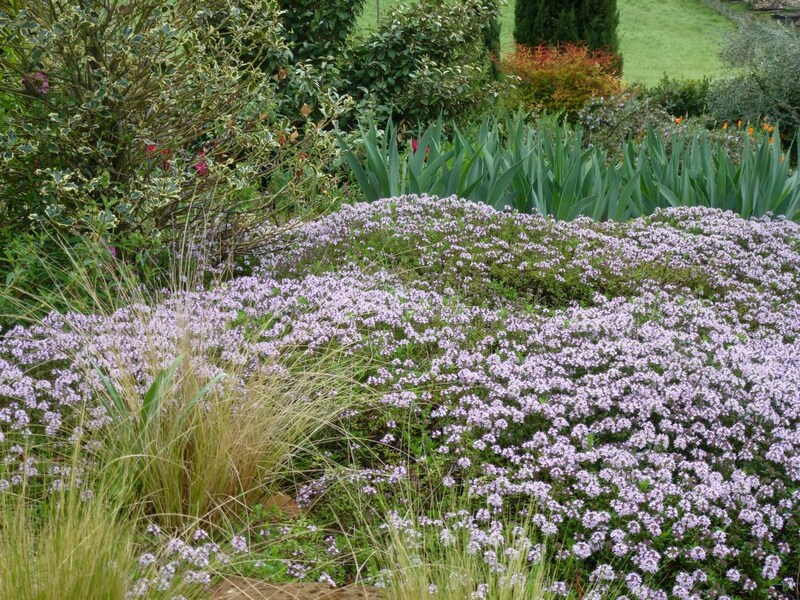 They are low growing and suitable for rockeries so should naturalise everywhere. Small sedum grow to cover the foliage. Here T. Negrita is paired with a silver leaved Buddleia (I think it’s called Silver Wedding) and a very fluffy, silver leaved Artemisia. The Negrita were planted in 2010 and I am almost sure there are more now than when I planted them. 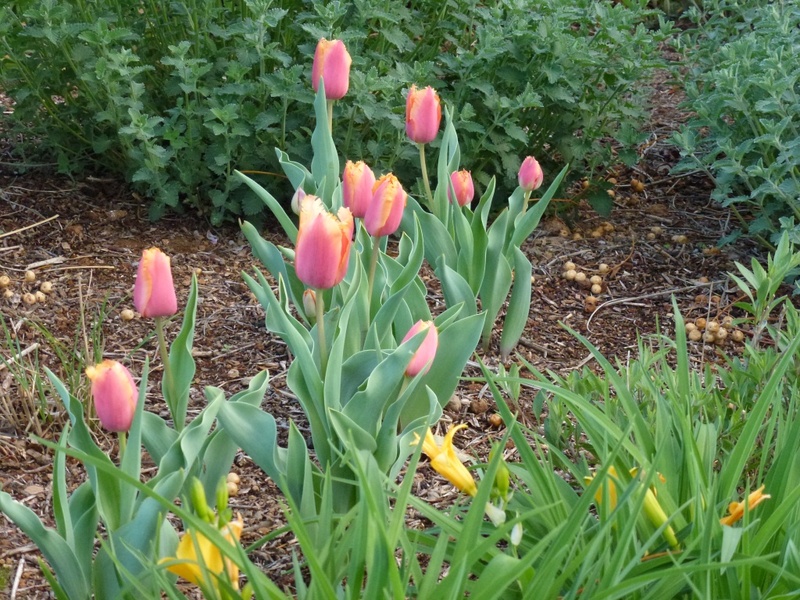 Others I planted in 2009 in the circular rose bed are also flowering again although not so well and I think this is because the rose bed is irrigated in summer and the tulips prefer to be left in baking soil if possible. Above, T. Pretty Woman planted on the upper drive bed – there are some Gaura here but what you can see is wild, self-sown Rocket. Perfect I can pick the leaves and it will grow taller to hide the foliage of the tulips as they die back. Fringed Lambada planted among Hemerocallis Stella d’Oro. 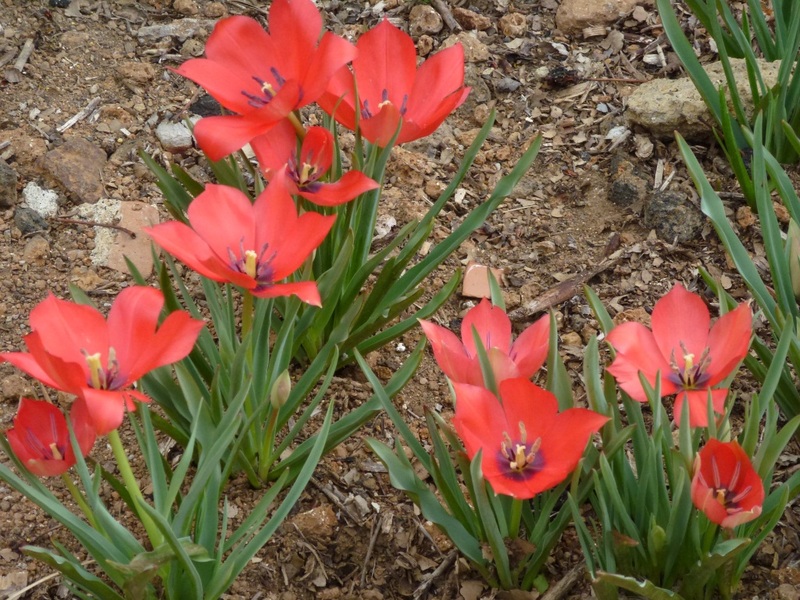 These are a beautiful tulip, described by Peter Nyssen where I buy all my tulips and other bulbs as rhodonite red, margins chinese yellow. 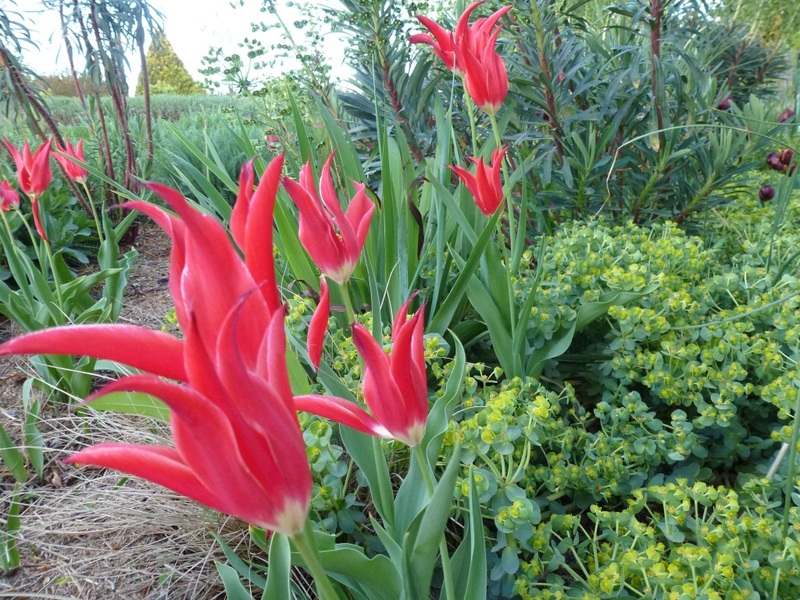 Thye have returned in the same numbers as planted in 2010 so well worth growing. I may have mentioned in posts about tulips last year that they have a strange habit of growth in my garden. They begin to open their flowers while their stems are still very short. 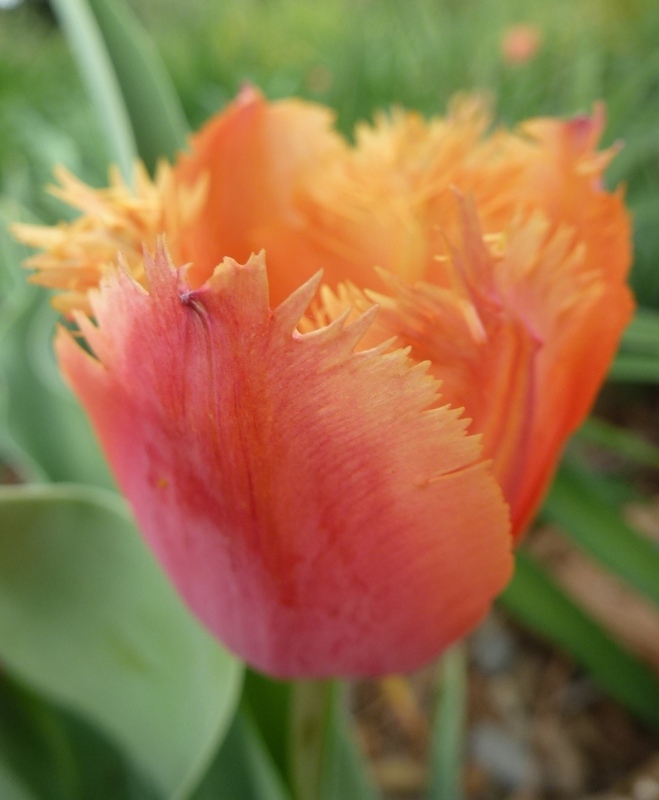 I did wonder if this was due to the fat that this garden is very windy, however, until the last couple of days there hasn’t been much strong wind and the tulips have maintained this growth pattern. 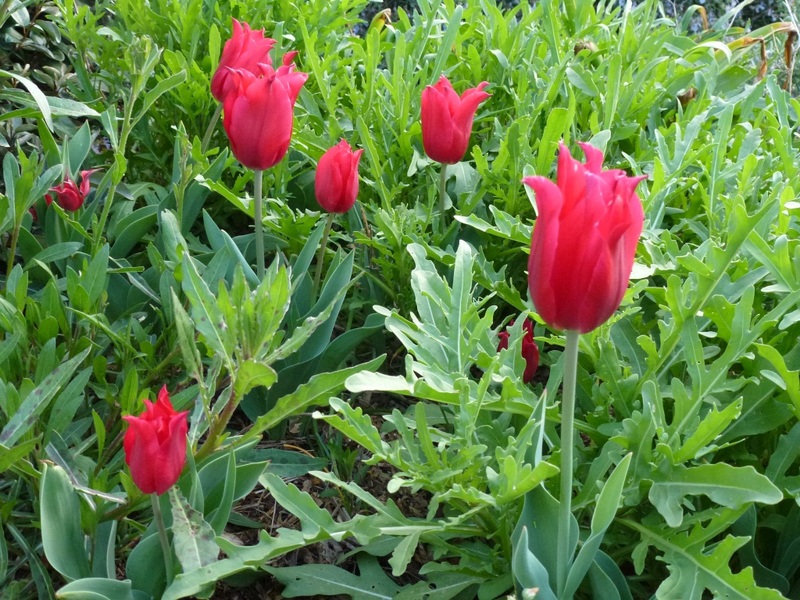 The stems do grow with the tulips continuing to flower but it certainly makes them less elegant at the beginning. Which varieties didn’t return? Just as useful and important to know when planning a long-term display. 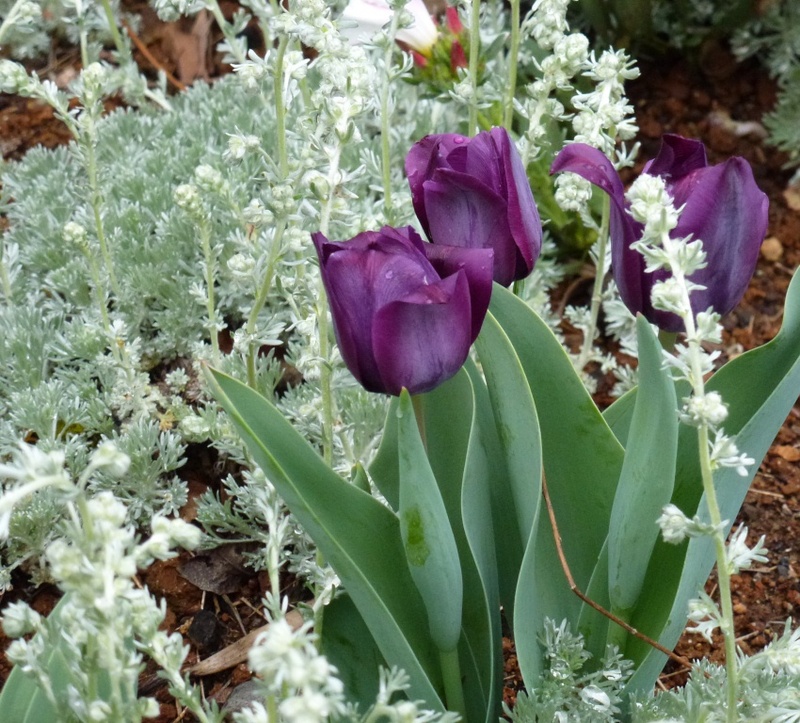 There was only one Fringed Blue Heron, however there were only a few last year I remember that these bulbs didn’t seem as good quality as the others when I planted them. I like the colour so I may try again. 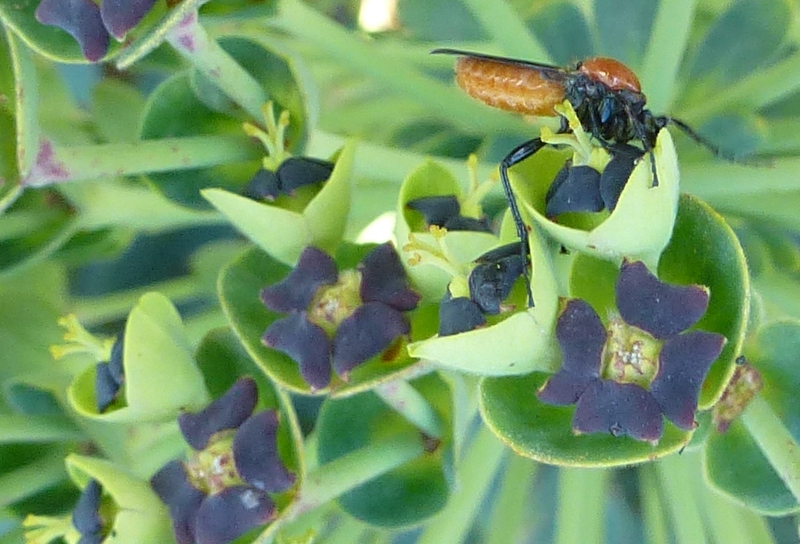 Euphorbia rigida has swallowed most T. Double Dazzle but again worth planting again anyway. There isn’t even any foliage to show where Double Early Peach Blossom flowered so beautifully last year. The disappointment is lessened because I had thought they were something else and the colour wasn’t what was needed in the Small Island bed. 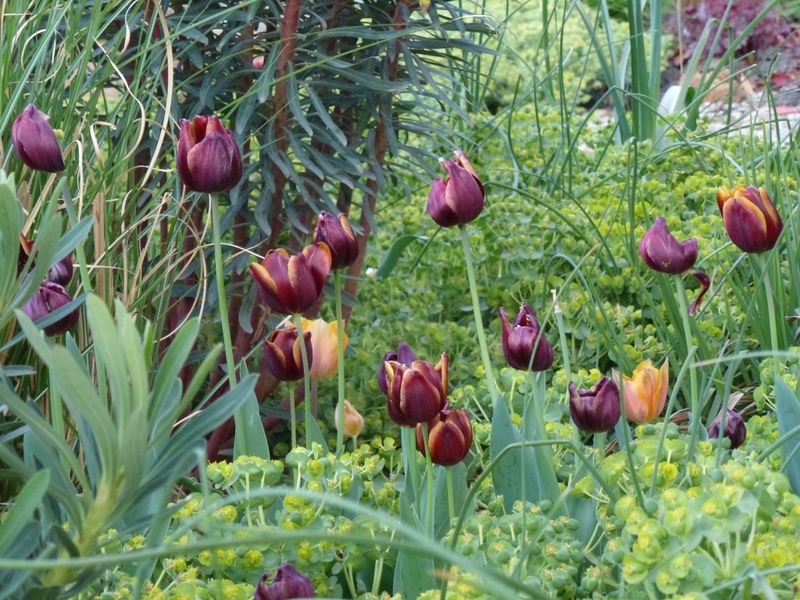 For more about early tulips in my garden this year see here. 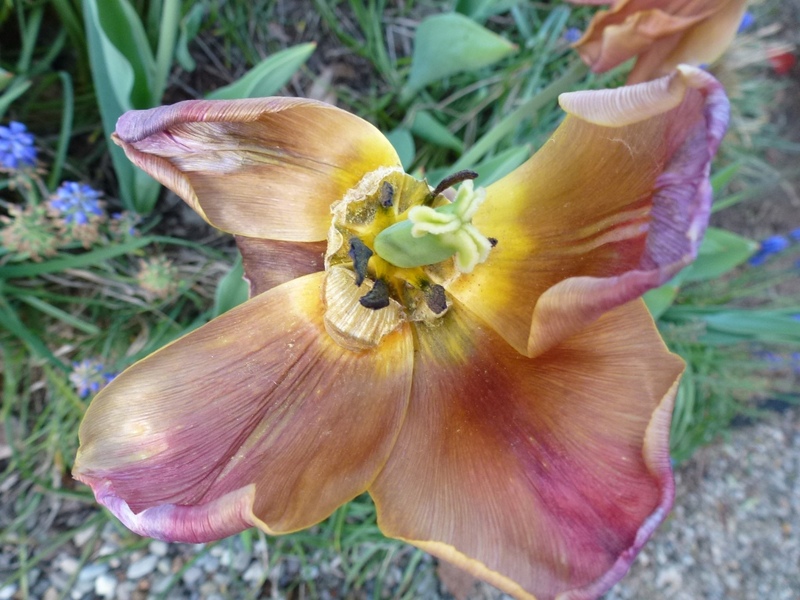 There are more tulips yet to open so the season will last a little longer, I’ll post about them and their companion plants later.